Invasion, he third of four planned DLC packs for Call of Duty: Ghosts, is available now on Xbox Live for Xbox One and Xbox 360, bringing with it some colorful and fantasy-fueled content. The new Dia de Los Muertos themed level “Departed” features an interesting “Death Mariachi” mechanic in which players can become the Death Mariachi and make others join their infernal band. The DLC will come to other platforms later. It costs $14.99, but can also be purchased as part of a $49.99 season pass that includes all four planned DLC packs. Call of Duty®: Ghosts players on Xbox One and Xbox 360 can now purchase Invasion, the game’s third epic DLC Pack. Invasion offers players four new multiplayer maps, plus “Awakening” – the next chapter in the game’s four-part episodic Extinction storyline, and more unique Field Orders, including the Death Mariachi, the Blessing of Anubis – the Half Jackal/Half Human Protector of the Dead, and Ghost Pirates. 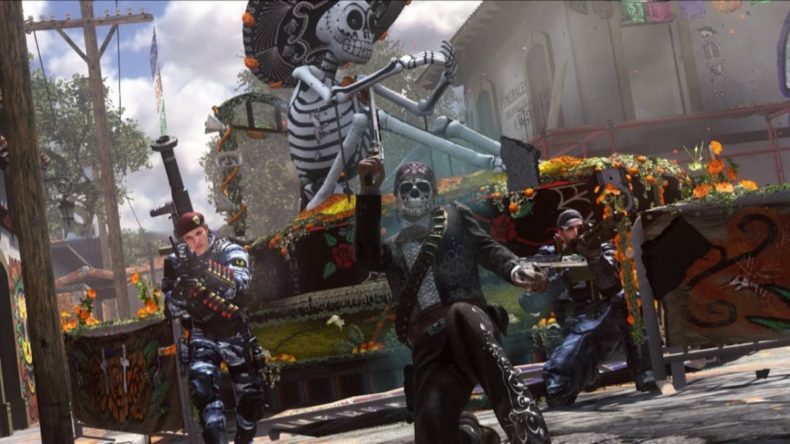 – Departed: Set in a rural Mexican town during the Dia de los Muertos (Day of the Dead) celebration, where players who complete the map’s unique Field Order will unlock the Death Mariachi killstreak. Armed with dual-wielding pistols, the Death Mariachi settles scores, with each kill turning enemy players into another member of the band, and a temporary squad mate. – Pharaoh: The abandoned archeological site of an ancient Egyptian palace. Players will have to be on the lookout for collapsing monuments and urns full of flesh-eating scarabs, among other surprises in this multi-level map. Players who unlock this map’s Field Order will be handsomely rewarded with the Blessing of Anubis, the half jackal/half human protector of the dead. – Mutiny: A remote Caribbean island harboring an eerie pirate hideout complete with abandoned trading posts and prison cells, where speed and stealth are a must as players navigate the narrow and intertwining pathways. Players that unlock “Mutiny’s” Field Order will find themselves escorted by two ethereal ghost pirates who will happily send enemy players down to Davey Jones’ locker on their behalf. – Favela: A refreshed version of the fan-favorite map from Call of Duty®: Modern Warfare® 2, this Brazilian shantytown has seen substantial change since its original release. Buildings once under construction are now complete, while others have crumbled into a state of disrepair. Players must avoid falling to their death as they traverse the map from one building to the next, avoiding enemy snipers taking advantage of the map’s long sightlines. Players who complete “Favela’s” Field Order will be able to call in air support from a nearby Y-8 Gunship. Invasion is available now exclusively for Xbox One, the all-in-one games and entertainment system from Microsoft, and the Xbox 360 games and entertainment system from Microsoft, a la carte for a suggested retail price of $14.99, or as part of the discounted* Call of Duty: Ghosts DLC Season Pass**. Call of Duty: Ghosts game sold separately and is required to play the Invasion DLC Pack.